This is a terrific project that I decided to build for myself. I never want to spend $75 on an iPod / iPhone dock that burns through batteries, but I would like an amplifier for my iPhone. This wooden iPhone dock is a fantastic project. The plans were inspired by others around the web including Koostik.com and a similar iPhone amp project at LumberJocks.com. This project was a great one that allowed me to work with my 9 year old son. He was happy to work with the drill press to help with the holes and with the spindle sander to clean them up. 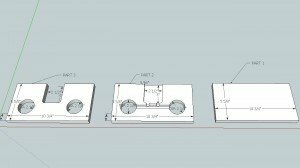 To construct your own, fabricate each of the 3 pieces from the Sketchup plan. Once you have your three pieces, align, glue, and clamp. After mine was fully set, I flushed up the edges with my chop saw. In addition to that, I wanted my iPhone amp to lean back a bit. This would help to retain the iPhone and give a more professional (finished) look to the piece. I set my saw blade at about 10 degrees and took a sliver off of the bottom. I also decided to put a routed edge on the speaker holes. I used a simple 45 degree chamfer bit. Perform any finish sanding needed, apply your sealant, paint, or stain, and enjoy! Others will ask you to build one for them. What kind of phone did you use? Didn’t see this comment until now, dash. I used cherry wood. I had some solid cherry panel doors that I cut up for material. Worked perfect for this project. Is there any way to make this stereo? Hi, I was wondering if you had any specs of this but modified for a galaxy S4? Thank you. Hey! This is beautiful! 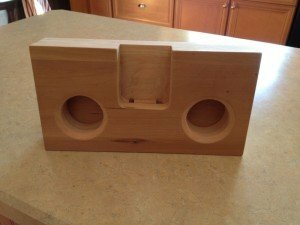 I work primarily with mahogany, do you know if this would change the quality of the speakers? And, I would be making two of these for Christmas but both my family members have Samsung phones. The speakers aren’t on the bottom of the phone. Do you know how I could make this work differently, while the speaker is on the back of the phone. Thanks for sharing this, you have great creative skills! Thanks. We are happy that this amp is a project that you can use. The amplification is not taking the sound quality into account, it is simply redirecting the sound. An audiophile would cringe at the quality (or lack of) with any of these sound redirection devices. Do you have any specs on the Samsung phones? 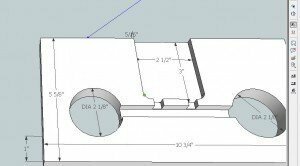 We could rework the Sketchup file to work for your phone. The iPhone only has 1 speaker on the bottom which is on the right side as you look at the phone, so that other hole is useless. The left opening on the phone is a microphone. On iPhone 7 and up the sound comes out the bottom right and the top (ear) speaker, so the phone would need to be in a horizontal position with the volume buttons up. Then you can make a channel on the lower left and one covering the very top of the phone to catch the sound from the front ear speaker. I’ve been thinking about building one for my iPhone X. Thanks Ryan. Definitely made the mistake with the 2nd port when making this some time ago. It probably did more harm than good. If you do make one, please share your plan here. Good luck. 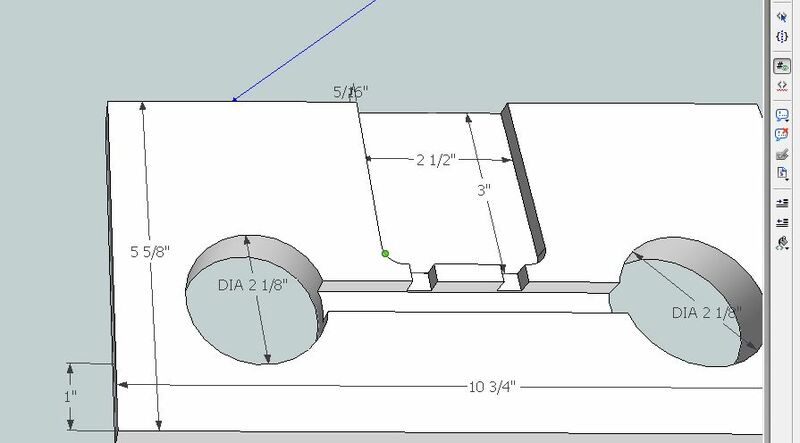 Great plan, one thing Im curious about is how you cut the angle in the middle piece for the phone to lay against? Thanks for the comment. I am not sure that I understand your question, but I will try. The angle is not in the middle piece. The angle comes by cutting the base at an angle after the assembly of the three pieces. The phone and the face of each piece are parallel. Does that make sense? If not, please respond and I will do my best to clarify. Does the opening for the phone need to be a precise fit? I was hoping to make it large enough to fit my Samsung galaxy S4 as well as my wife’s iphone 5, but not sure if that would loose some of the amplification for her smaller phone? I almost think that it is a personal preference. As long as your speaker lines up with the channel, you should be fine in terms of the amplification. I made mine with a few MM to accommodate an iPhone case. As we all know, this isn’t likely to fit whatever the iPhone 6 turns out to be. Good luck and feel free to e-mail a picture of your finished project to [email protected] if you want us to include your version in the article/post. Just made my first from a plan in wood magazine and love it already have additional prototype plans to attemp to improve on the design. Mine is funny looking, but a next wood project with Brazilian cherry and oak. Something a friend told me today improved the sound quality drastically, I put 2 pieces of surgical gauze in the slot for the phone, and it made a much richer sound, you sould try it. Can’t share the plans as they came from wood magazine, but if I have success with my prototypes this weekend I can share. Shoot me an email and I can send you pic. You are correct in your assumption. The three pieces are simply 1″ stock (3/4″ true thickness). Very simple project with a cool impact. Good luck with your own. Hi this looks like a great idea, but the link isn’t working now. What to do? The links should now be working properly. Let us know if they are not. I haven’t worked out the wavelength numbers yet, but by placing the phone off center you will create a delay/phase shift between left & right which “could” lend a “spatial” effect to the mono sound source. I also think the offset would be visually interesting. You could also play with “tuning” the ports, ie. different size bores, making them “horn shaped” parabolas, extend tubes out the back for even more acoustic – and wood working – fun! LOVE your woodworking! Thanks Joe. I knew that a real audio guy could jump on this and make something that didn’t just direct the sound to boost, but could also suggest/create a way to improve the quality of the output. I have to be frank, I am a woodworker, not an audiophile or an iPhone nut (just a user). When laying this out, I was not even aware that the left side was a mic. At a certain point, we felt that we had a broken iPhone with sound only emitting from 1 speaker. We looked it up and found that the left was just a mic. Of course that was after laying out the plan. Please note! The iPhone does NOT have stereo speakers. The left side is a MICROPHONE. Just place your thumb over one side or the other to test this. Just picked this up for use with my Hi school carpentry classes.Looks good! Thanks so much for posting these plans! We just got a CNC machine at our school and we recently learned how to use sketchup files and use them to cut out 3D forms with the router! Thanks again for sharing! You are welcome. A CNC machine opens up MANY more possibilities with this device. This amplification is crude and the output could be greatly improved with some additional milling. You might want to consider a cone shape on your channel as it enters the “speaker” hole. Just a thought. I am sure some audiophiles would be able to chime in with suggestions that would amplify better. PS: If you want some help tweaking the Sketchup file, let me know. I would be happy to make some changes if you need. That is just awesome. The possibilities. I can link to the pdf version but the Sketchup file appears to be missing. Can this link be repaired? I created a couple of new versions (output). At the bottom of this post, you will find a list of links that include a Word Doc version and PDF version, along with three (3) larger scale images. I hope that this helps. From a user: I’ve just seen your piece on the wooden iphone amp. I want to give the plans to my retired father as something to do but can’t open .skp files. do you have them as a PDF to use? Sorry, my workplace won’t allow a download of the software needed to open .skp. Great site by the way – going to have a nose around now!